GEORGETOWN, DE – Stewart Friesen makes his living behind the wheel of a dirt Modified, often racing more than 100 times in a single season. He has not, however, turned a lap in the state of Delaware since 2009 during a stint as Maryland car owner Will Brown’s hired driver. Friesen, a native of Niagara-on-the-Lake, Ont., who now resides in Sprakers, N.Y., will change that on Saturday, March 12 when he heads to the First State for the Melvin L. Joseph Memorial at Georgetown Speedway. Friesen, whose most recent Delaware start resulted in a second-place finish at Delaware International Speedway in November 2009, circled the Georgetown date on his calendar since the Bob Hilbert Sportswear Short Track Super Series (STSS) Fueled By VP event was announced last fall. Friesen, who led the Northeast with 34 victories in Modified and Sprint Car competition last year, has been brushing up on his Georgetown knowledge by watching YouTube videos of the half-mile track. “The track looks fast, and definitely racy,” Friesen said, noting he’ll be heading south with both a big- and small-block combination in his Halmar International race team’s hauler. Friesen looks toward his first season driving for Chris Larsen’s potent Halmar-backed race team. 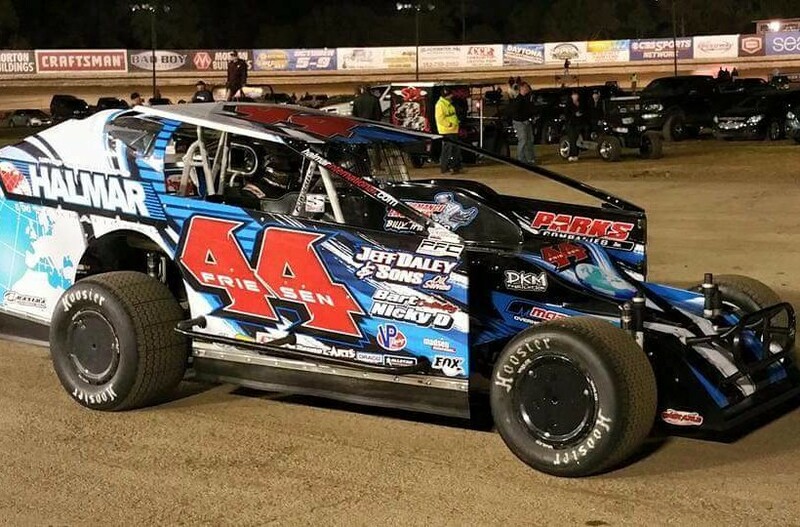 He kicked off his 2016 season in Florida at Volusia Speedway Park with four nights of racing. He never finished outside the top-six and ended the mini-series with a runner-up finish in the 50-lap finale. “We got some notes to build on in Florida I think we can apply for the rest of the year,” he said. Last season, Friesen won the STSS North Region championship, picking up four series wins (New York’s Orange County, I-88, Woodhull and Thunder Mountain) en route to the title. In ’16, Friesen plans to not only defend his crown in the Halmar International North Region; he will also chase points in the Velocita South Region, which kicks off at Georgetown. Georgetown roars to life on Saturday, March 5 with an open practice. Gates open at 1 p.m. and cars hit the track at 3 p.m. Grandstand admission is FREE and pit admission is $20. The Melvin L. Joseph Memorial Race weekend is set for Friday-Saturday March 11-12. On Friday (March 11) open practice is planned. Gates open at 4 p.m. with practice at 6:30 p.m. Grandstand admission is FREE. Pit admission is $20. The grand reopening of the fabled Georgetown Speedway is Saturday, March 12 with the Melvin L. Joseph Memorial. The Bob Hilbert Sportswear Short Track Super Series (STSS) Fueled By VP big-block/small-block Modifieds race 49 laps for $4,900 to win, $1,000 for 10th and $490 to take the green flag. This event is Round No. 1 of the seven-race STSS Velocita South Region with a total point fund of more than $25,000. Also on the March 12 card: Crate 602 Sportsman, Southern Delaware Vintage Stock Cars, Little Lincolns, Delmarva Chargers and Delaware Super Trucks. On Saturday (March 12), pit gates open at 11 a.m. and grandstand gates are unlocked at noon. The drivers’ meeting takes place at 2:30 p.m., with hot laps at 3 p.m. and racing at 4 p.m. Admission is $20 for Adults. Seniors (ages 65 and up) and Students (ages 13-17) pay $16. Kids 9-12 are $10 and those under eight are admitted FREE. Pit admission is $35 (ages 13 and up), $10 for Kids 6-12 and $2 for those five and under. A Sunday, March 13 rain date for the Melvin L. Joseph Memorial will be utilized if needed. A new website is live for the speedway at www.thegeorgetownspeedway.com. Like Georgetown Speedway on Facebook, follow @thegtownspdwy on Twitter, e-mail georgetownspeedway@gmail.com or contact Brett Deyo at 845.728.2781 during business hours for more information. To learn more about the Bob Hilbert Sportswear Short Track Super Series Fueled By VP or BD Motorsports Media LLC, visit www.shorttracksuperseries.com or www.bdmotorsportsmedia.com, call 845.728.2781 during business hours, e-mail bdmotorsportsmedia@gmail.com, “like” Short Track Super Series on Facebook or follow @ShortTrackSS on Twitter.